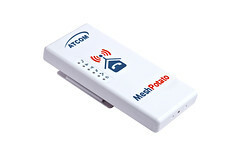 The Mesh Potato is a device for providing low-cost telephony and Internet in areas where alternative access either doesn’t exist or is too expensive. It is a marriage of a low-cost wireless access point (AP) capable of running a mesh networking protocol with an Analog Telephony Adapter (ATA). Here is the story of how the idea of the Mesh Potato came about. The first prototypes of the Mesh Potato were built in June of 2009, almost exactly a year after the Mesh Potato concept was conceived of. In late 2009, we launched a “beta” test of about 150 Mesh Potatoes in about 20 different countries. Based on feedback from beta testers and design refinements, the Mesh Potato has gone through several iterations and developments. The production Mesh Potato can be seen at the right. Click on the image to get a higher resolution version. More detail can be found in the Features and Specifications below. The Mesh Potato went on sale in September 2010 and can be ordered through the online store of this website. For larger orders and wholesale pricing, please get in touch via the contact form on this website. Integrated Wifi and ATA in a single box Low power consumption, ease of setup, fewer cables, fewer points of failure, and low cost. One-IP configuration Set one IP and the device is ready to make an receive phone calls. Quickly build voice and IP networks and roll out a Wireless PBX in minutes. Web GUI or Phone UI Configure via a web interface or telephone IVR menu. With Phone UI no laptop is required for on-site installation. UV-resistant, weather-proof enclosure Long life outdoors, no need to purchase a separate enclosure for out door use. Built in mounting points Simple and low cost outdoor installation. Rugged design Withstands abuse that would destroy other products such as power surges, brownouts, reverse DC, over-voltage DC, and static electricity. Wide range DC power supply Runs on any DC voltage from 10V to 40V, or any AC voltage from 110 to 250VAC via wall-plug type power supply. A solar panel can be directly connected – saving money on a solar regulator. Power efficient Consumes just 2.5W (DC). Can run on a 10W solar panel. Power over Ethernet (PoE) and Power over Telephone Line (PoTL) Just one cable run for both power and telephone. PoTL injector included. Open Hardware Design No vendor lock-in. Open to improvement by anyone. Open Source firmware Linux, OpenWRT, B.A.T.M.A.N., and Asterisk. Stable, reliable community developed software. Open to improvement, adaptation, and innovation.